Pembrokeshire holiday cottage, the Cwtsh at Ffynnon Clun, restored barn in traditional longhouse on west Wales coast, self catering, bed and breakfast, camping Page 9. Eggs from the organic free range hens at Penrhiw, the farm next door. 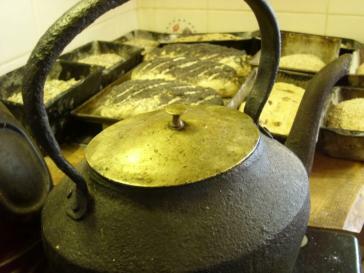 Bread baked here at Ffynnon Clun - that gets a web page of its own. Cheese from Llangloffan and other local diaries. Fruit from Ffynnon Clûn orchards and Pengelli Organics. Marmalade and pancakes from our kitchen. Pembrokeshire organic milk from Trioni, Abercych. All other produce is as local, seasonal and organic as possible. twenty yards from the Cwtsh, the ancient Ffynnon Clûn spring. pancakes. Once tasted, never forgotten. in our pantry and freezers – don't hesitate to ask. your food will be at the Cwtsh on Thursday. freezer ready for your arrival.